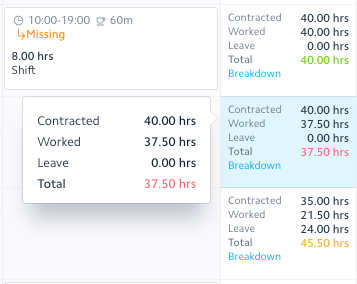 Timesheets are used to reconcile hours actually worked by employees. 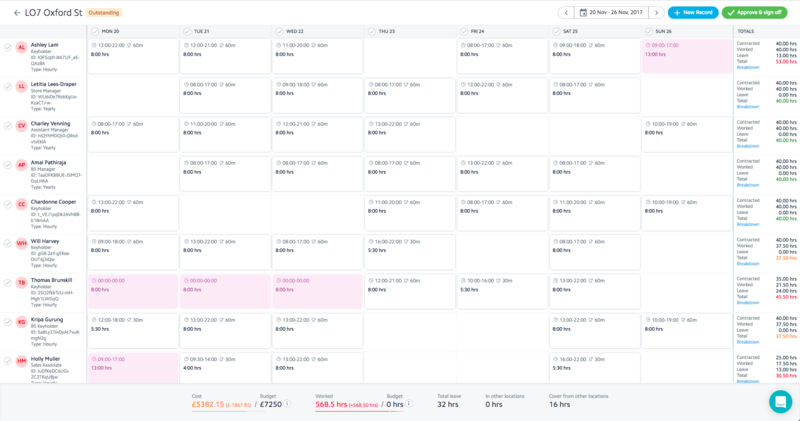 The Scheduler is a tool used to plan the hours for your Location; Timesheets allow you edit and record the times an employee was present for a shift, attach payroll codes to entries and finally submit these hours to your Payroll department. Once a rota has been approved, the entries are pulled into the Timesheets ready to be edited and sent off. To edit an 'Outstanding' week all you need to do is click on the entry, this will pull up the Timesheet for that week. The Timesheet displays in a similar way to the Scheduler to make it easy to see which employee worked what on each day. Your employees are displayed down on the left hand side, days of the week and dates along the top and totals bar at the bottom. On the right hand side you will see the totals for each employee with colour indications to highlight the number of hours worked against their contracted hours: green = correct number of hours; red = below number of contracted hours; amber = over number of contracted hours. Unapproved 'Shift' entries will display white, unapproved 'Leave' entries will display in purple and all approved entries will display green with a tick. If there are any unapproved entries within a Timesheet, it will display as 'Outstanding', once signed off it will display as 'Completed'. If you have the 'Enable Timesheet review process' setting turned on then you will have enabled the 2-step sign off process. As per the first process, your Timesheet will show as 'Outstanding' when entries need to be approved. Once this is approved and signed off it will instead appear as 'Submitted' and will be sent over to your Payroll department. Your Payroll department will then be able to review and/or send it back to you if anything is not right and needs to be changed, if so the Timesheet will go back to 'Outstanding'. Once Payroll have signed off the Timesheet then it will show as 'Completed'.